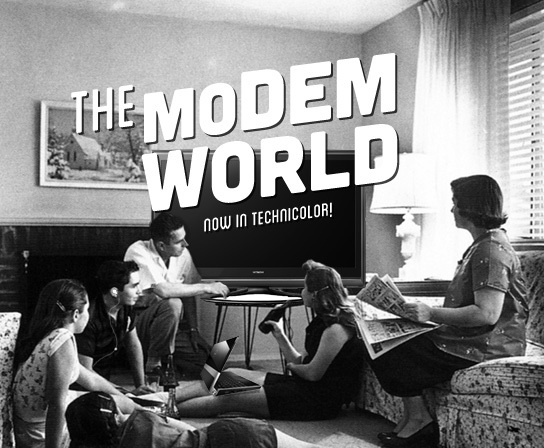 Engadget: This is the Modem World: Give me the keys, I'll drive! "Give me that" I huffed, teeth clenched. Snatching the iPhone from my friend's hands, I swiftly pulled up directions to The Grove despite the inadequacies of Apple's new Google Maps replacement. While I'd rather have the old Google Maps back, I was able to work around the quirks and get what I needed. On Saturday, my fiancée and I sat down to watch a movie on Netflix. She simply handed the remote to me as she knew I'd have things set up in no time: I knew which activity to select on the Harmony One, to switch on the PS3 and how to search on the console's version of the Netflix app (each one is bizarrely different for some reason). Yes, she could have gotten us there, but I'm a better driver. She would have used the Netflix app on our connected TV. It works, but it uses the TV's speakers and I need to watch things with glorious 5.1. Does she care? Not so much. But she knows that I drive our tech better than she does and she's happy to leave it to me. Continue reading This is the Modem World: Give me the keys, I'll drive! This is the Modem World: Give me the keys, I'll drive! originally appeared on Engadget on Wed, 10 Oct 2012 18:00:00 EDT. Please see our terms for use of feeds.